It is not what he has, nor even what he does, which directly expresses the worth of a man, but what he is. He is a child of God. He is my son. I am honored to be his mother. 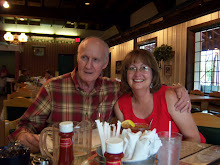 He is in his final days at home before leaving for USAF Basic Training. He sings in the church choir. 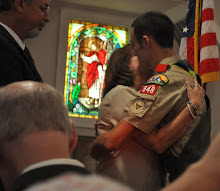 He is an Eagle Scout. He is 19 years old. He is the next generation. He is loving. He is my only son. He is honorable. And the list goes on. The creative juices are flowing this morning. This message is where my heart is at the moment. Where is your heart right now? On what are you focused? Are your thoughts focused on something worthy or something useless? I'm sure you remember the old commercial "The mind is a terrible thing to waste." Don't waste one precious minute of your life on useless nonsense thinking. Finally, brothers, whatever is true, whatever is noble, whatever is right, whatever is pure, whatever is lovely, whatever is admirable -- if anything is excellent or praiseworthy -- think about such things. Whatever you have learned or received or heard from me, or seen in me - put it into practice. And the God of peace will be with you. Sometimes the most powerful words are the ones we withhold. Remember, there is a time to be silent and a time to speak. My words here at Nan's Calendar have been few and far between of late. I hope you have continued to visit the site and browse through the archives in my absence. When you visit and don't see a recent message, say a prayer for me, then pray for someone else and pray for yourself. I only write what I know in my heart is true for me. Each one of you will decide for yourselves what you believe to be true. Hi! I didn't fall off the face of the earth since the last time I wrote to you! There are always so many factors involved that make for a very interesting life and time management is so important. Allen and I exercise together regularly and I take time to meditate most mornings. I'm very involved in my Nan's good will bears project. To make a long story short, I was at my dry cleaners shop on Saturday and cleaned 62 bears as part of a United Methodist Church community wide volunteer day. Since this teddy project is a community service project and the kids can't receive a bear until it has been professionally cleaned, I decided to render my volunteer services by going through the proper channels and spent three hours cleaning the bears to help Jeff, my cleaner, as he has a full time business to operate. The supply of bears in the ER had gone down to only two available a week ago. So you see how important it was to get ahead of the curve. Our son, John is at the one month mark now. He leaves for USAF Basic Training in San Antonio, TX on November 8th. Allen and I spend as much time as possible with him making memories. We are happy for him and support his decision.